ST. CATHARINES, Ont. 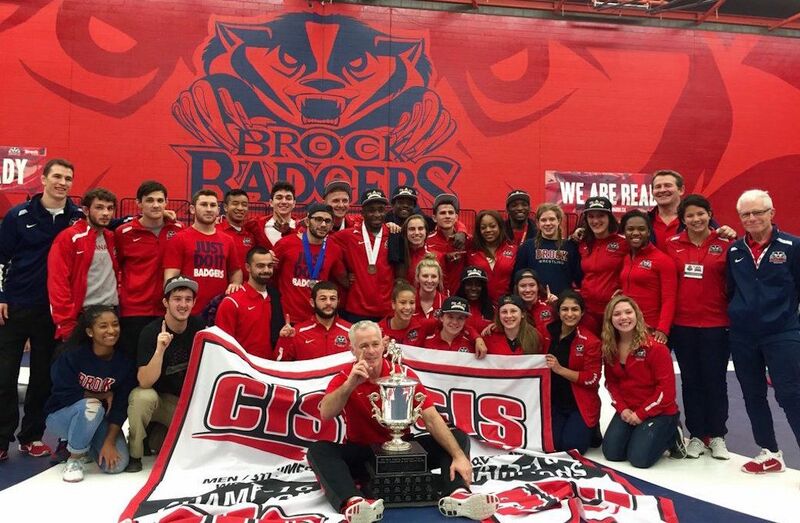 (CIS) – One year after becoming the first program to sweep the team banners for a second straight campaign, the hometown Brock University Badgers accomplished the feat for the third consecutive season on Saturday as the 2016 CIS wrestling championships came to an end in front of a capacity crowd at the Bob Davis Gymnasium. In women’s competition, Brock became the first team to win five straight national titles, breaking a tie with the Simon Fraser Clan (2003-2006). 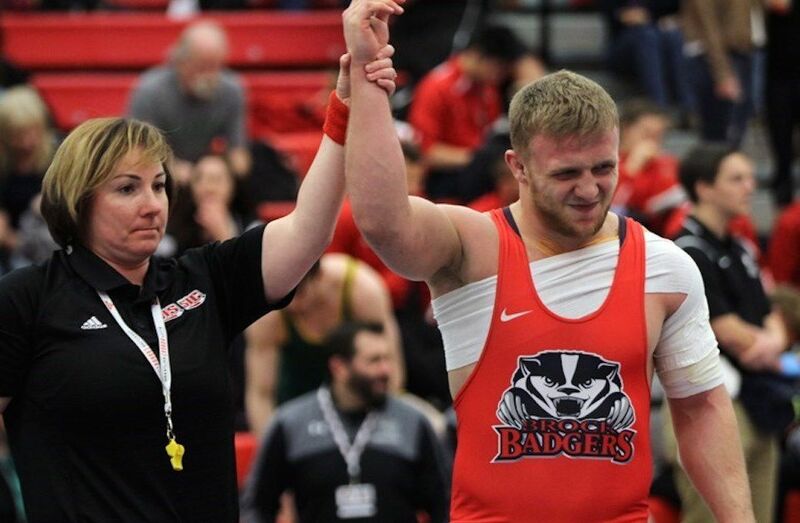 The Badgers claimed medals in seven of eight weight classes (4-3-0) to finish the tournament with 69 points, well ahead of second-place Calgary (39 points) and bronze medallist Guelph (33). The local favourites were as dominant on the men’s side on their way to their third championship in a row as all 10 of their wrestlers collected medals (2-6-2). Their team total of 80 points proved way too much for McMaster (52) and Concordia (41), which rounded out the podium. Capturing individual gold medals for the Brock women were Tina McLaren (51 kg), Carlene Sluberski (55 kg), Emily Schaeffer (59 kg) and team captain Olivia Di Bacco (72 kg). Sluberski has now won the 55 kg title in each of her four university campaigns, while Di Bacco was crowned for the first time and became the first female wrestler in CIS history to finish her career with five team banners. Other individual women’s champions included Allysa Cleaves of UNB, who was named the CIS female wrestler of the year following her triumph over Brock’s Garrantina Gatta in the 48-kilogram final, as well as Linda Morais of Concordia (63 kg), Alison Carrow of Guelph (67 kg) and Holly Ellsworth-Clarke of Calgary (82 kg). In the men’s tourney, Miram Tamaradze (61 kg) and Jevon Balfour (82 kg) led the charge for the Badgers with gold medals. They were accompanied in the winners’ circle by Oren Furmanov of Guelph (54 kg), Josh Bodnarchuk of Saskatchewan (57 kg), Vince de Marinis of Concordia (65 kg), Michael Asselstine of Alberta (68 kg), Ahmed Shamiya of McMaster (72 kg), Aleksandra Soronov of Winnipeg (76 kg), Jordie Steen of Concordia (90 kg), Finn Higgins of Winnipeg (100 kg) and Tyson Frost of Guelph (120 kg). Asselstine and Higgins shared the outstanding male wrestler award after they both defeated Brock opponents, Matt Jagas and Ignatius Pitt, respectively, in their gold medal matches. Asselstine, who moved up two divisions this season from 61 to 68 kg, was honoured for the third straight campaign and became the first CIS wrestler – male or female - to earn the distinction three times over his career. Brock mentor Marty Calder swept the TIMEX coach of the year awards (women’s and men’s competition) for the third consecutive season. NOTES: Saskatchewan’s Kiera Prior (82 kg silver) and Western’s Ligrit Sadiku (57 kg bronze) were named the CIS female and male rookies of the year... York’s Alexandria Town merited two individual honours in addition to her bronze medal at 55 kg, taking home the R.W. Pugh Fair Play Award and the Community Service Award... On the men’s side, the awards went to Winnipeg teammates Brock Munro (R.W. Pugh Fair Play Award) and Kyle Nguyen (Community Service Award)... Munro finished sixth at 72 kg and Nguyen claimed bronze at 120 kg. NOTE: Tie-breaker is most gold, then most silver, etc.